Are you unable to Open Exchange OST file to PST..? 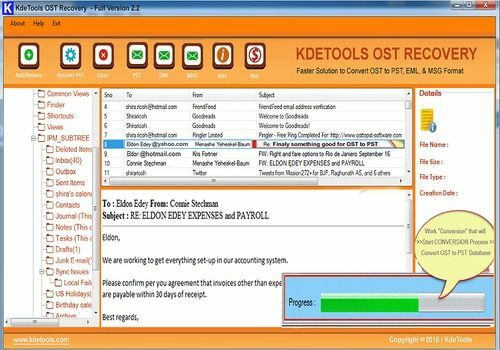 Due to corruption in Microsoft Exchange server so don’t worry Microsoft Exchange user here at KDETOOLS for OST to PST Converter software is easy to use with 100% guaranteed works. This tool is available for coming you out from all corruption issues. This OST to PST Converter software 100% safely and quickly recovery of corrupt Exchange OST file as well as Export OST file into Outlook PST file format with original format. Best OST Recovery toot can smoothly Restore OST file and Convert OST into different file format like – Outlook PST format, EML format, MSG format, HTML format, TXT format, RTF format XHTML format quickly. OST Recovery tool quickly repair inaccessible OST file along with To, Cc, Bcc, Subject, Date, and Time in less time. Superb OST to PST Conversion software helps you to convert OST to PST with whole mailbox elements - Inbox, Outbox, Sent Items, Deleted Items, Draft, Journals, Tasks, Calendars, Notes, and Contacts. FREE Download OST Recovery software works on all Microsoft Exchange and Microsoft Outlook versions. Get FREE download OST Recovery tool provide you free recovery and preview facility to recover unlimited OST file mailboxes items and then buy it full version only at lower price.